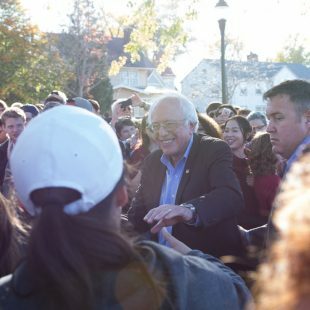 This campaign season has proved that Bernie Sanders is no stranger to Iowa City. 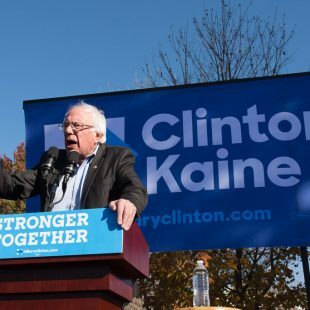 The Vermont Senator and former Democratic Presidential candidate returned to campaign for Democratic nominee Hillary Clinton on Friday. Sanders spoke along with Johnson County Democrats Mike Carberry and Rod Sullivan of the Board of Supervisors, as well as Kurt Friese, a candidate for the Board of Supervisor. Sanders urged voters to back Clinton and defeat Republican contender Donald Trump. Vermont Senator Bernie Sanders said in her first 100 days, Clinton will put forth a constitutional amendment to overturn Citizens United. 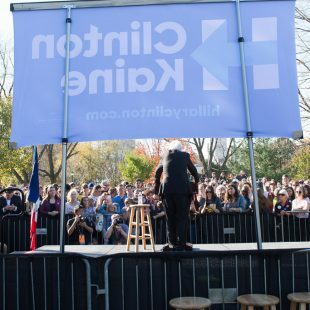 Sanders campaigned for Hillary Clinton at College Green Park in Iowa City. 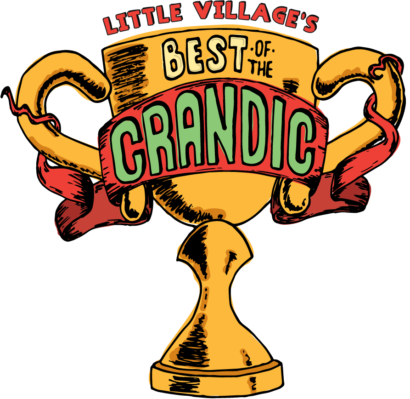 Friday, Nov. 4, 2016. — photo by Zak Neumann. 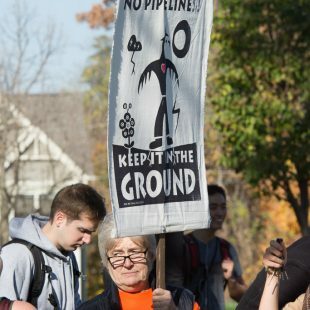 One of a few pipeline protest signs in the crowd at College Green Park. Sanders pushed voters to elect politicians who want to mitigate the effects of climate change. Friday, Nov. 4, 2016. –photo by Zak Neumann. 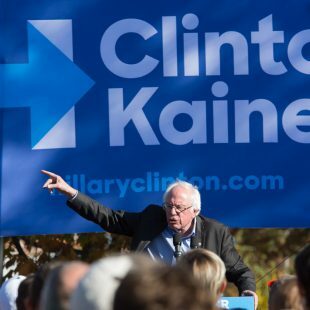 Vermont Senator Bernie Sanders encouraging people to vote for Hillary Clinton. 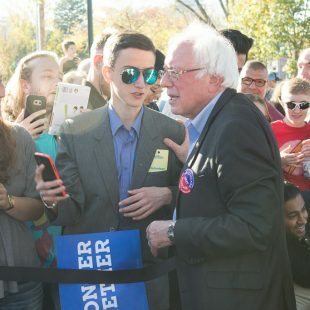 Sanders stopped in Iowa City after cancelling a rally in October. Friday, Nov. 4, 2016. –photo by Zak Neumann. 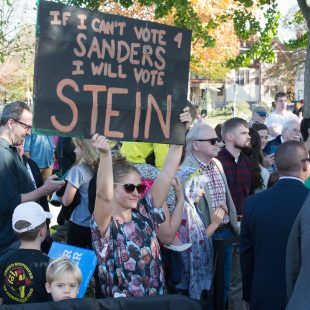 A lone protest in favor of Green Party candidate Jill Stein took place in the crowd at College Green Park. Sanders spoke of the need to rally behind Clinton in order to prevent a Trump presidency. Friday, Nov. 4, 2016. –photo by Zak Neumann. 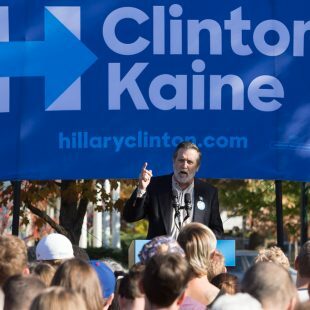 Kurt Freise speaks at a Hillary Clinton campaign rally at College Green Park in Iowa City. Friese is a candidate for the Johnson County Board of Supervisors. Friday, Nov. 4, 2016. –photo by Zak Neumann. Vermont Senator Bernie Sanders on stage at College Green Park in Iowa City. 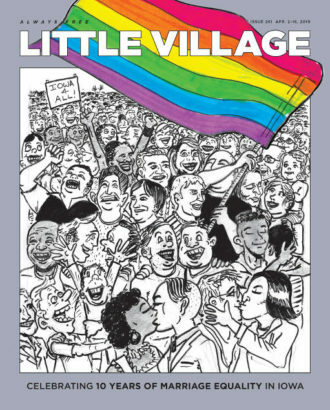 With only four days until Election Day, Sanders encouraged people to vote Clinton. Friday, Nov. 4, 2016. –photo by Zak Neumann. Vermont Senator Bernie Sanders shakes hands after campaigning for Hillary Clinton at College Green Park. Sanders speech garnered support from the audience on issues such as climate change, healthcare and education. Friday, Nov. 4, 2016. –photo by Zak Neumann. Bernie Sanders speaks with supporters and takes selfies following a Clinton campaign rally. Friday, Nov. 4, 2016. –photo by Zak Neumann. Senator Bernie Sanders makes his way through the crowd of supporters. 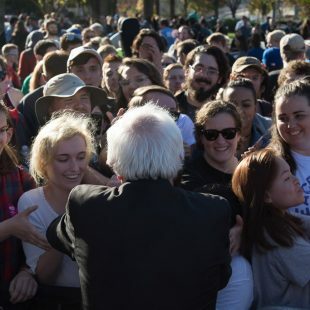 Sanders shook hands with many after a Clinton campaign rally. Friday, Nov. 4, 2016. — photo by Zak Neumann.